Photo courtesy of the Champaign County Historical Society. 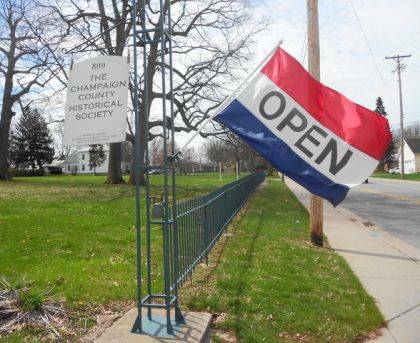 https://www.urbanacitizen.com/wp-content/uploads/sites/36/2018/04/web1_Web-11.jpgThe Champaign County Historical Society will be open 1-5 p.m. on Sundays starting this Sunday. The museum will continue to be open 10 a.m.-4 p.m. Mondays and Tuesdays. The museum is located at 809 East Lawn Ave., Urbana, and is open to the public free of charge. “Most Champaign Countians recognize that we are an all-volunteer organization and are not able to hire staff to operate the museum at this time,” CCHS President Dan Walter said. “That said, we have worked hard to recruit additional volunteers and will be opening on Sunday afternoons on a trial basis. We encourage others interested in helping to call the museum at 937-653-6721.” Photo courtesy of the Champaign County Historical Society.